When an iron-rod is placed for a sufficiently long time in the blazing fire, it acquires the characteristics of the fire, becomes the fire. Even so, when our entire consciousness is placed, for a sufficiently long time, in the intensive meditation upon God, or the Divine Mother, it assumes the form, the nature, the qualities of God. Dwell upon the object of your meditation with such intensity, that you become what you meditate upon. Make the meditation hour a blazing thing, an absorbing thing, an inner spiritual state which consumes all our energies in God-experience. Gautama Buddha, the founder of Buddhism, obtained the highest spiritual enlightenment through meditation. Thousands of years before his birth on earth, hundreds of saints and seers of ancient India not only achieved the highest states and conditions of God-Consciousness through meditation, they have also formulated ways and means of practising meditation properly. However, meditation is not an Eastern art. It is the art of every sage and every man of God-Consciousness. Christianity disclosed this art to the early monks, and we have many evidences of the practice of meditation by the Desert Fathers, the Christian saints of the Egyptian desert. Several saints and mystics have, through the centuries of the Christian experience, resorted to the practice of meditation for the achievement of the highest God-Consciousness. St. Ignatius of Loyola had evolved special types of meditation and spiritual exercises. Such saints as St. John of the Cross, St. Theresa of Avila, and several other saints like Anthony, have practised meditation. Practice of meditation is universally prevalent. It is the method which the greatest among the geniuses of the world, and the saints and sages, have unconsciously, spontaneously resorted to. Meditation is nothing but a withdrawal of our consciousness from the external world, an abstraction of the consciousness from the senses, a liberation of the consciousness from the body we inhabit, from the mental activities, and a focusing of it upon the greatest Reality that is within us, upon the real nature of the supreme God. In the process of the practice of meditation, several supernormal powers of the inner being come into operation. The nature of the Divine resident in our inner being, seeks to express itself. Sometimes, the psychic powers are awakened. The divine energies and potentialities of our inner being are brought into action. Through the type of meditation I have touched upon earlier, one begins to explore the richest content of the highest Consciousness latent in us. Elementary textbooks in psychology and psychoanalysis disclose to us the underground ranges of consciousness called the subconscious and unconscious. Neither scientists, nor psychologists, nor yet the worldly wise, can be expected to investigate into and present the nature of the superconscious in us. There is that higher Consciousness in us, which is above, beyond and behind the conscious, subconscious and unconscious levels. This superconscious Being in us, is the essential nature of our being. It is the Godhead in us. It is always in conscious and intimate relations with the infinite Divine Consciousness. It bears in itself the infinity of beauty and power. The mansions of the Kingdom of Heaven are in it. Purity of heart, the transformation of our entire human nature, the practice of meditation that liberates our inner consciousness from the external encrustment, from the bodily and the sensuous experience, from everything phenomenal and empirical, from everything other than itself, brings us face to face with the highest reaches of our inner consciousness. Much practice of meditation is presupposed, in the experience of the real nature of the wondrous divine Consciousness within us. We will be brought face to face with God's Nature, Power and Being, in the hours of proper and right meditation. Meditation is the avenue through which we enter into the illuminating and all-fulfilling Nature and Being of God. Our daily life in the nerve-shattering modern world, becomes a song of strength, energy, peace, joy, success, prosperity. Meditation is not a mental discipline. Mind is suspended in its activity. Real meditation is possible only by going beyond mental phenomena. Meditation is an energization of our inner spiritual consciousness. It is the functioning of the highest consciousness in us. It begins the moment we transcend the objective and the subjective environment, the limitations of the body, mind, will, heart, life. This meditation releases us into the timeless and spaceless Consciousness of God. We begin to dwell in the illimitable Light of God. We begin to dwell ecstatically in the unbounded Love of God. Our whole inner being becomes radiant with the Powers of God. We are, in ourselves, at that moment, in that state and condition of consciousness, the endless and illimitable Light. We become one with the all-creative Consciousness of the Infinite. It is here that we truly know God, are the real Sons of God, abide in our essential divine nature, and consciously and fully enjoy the immortal life, the life which is termed by the Bible as the everlasting life, the abundant life. It is then that we find an absolute peace abiding in us, a peace which is God's own. It is then that we could closely grasp the highest truth that the light in us, which is our essential being, is one with God. Not just a few individuals here and there, but thousands of persons have achieved this state of consciousness, through meditation. Not six thousand, or two thousand years ago, but in every century, man has attained to this consciousness. At no period in human history were the mystics, or men of God-Consciousness, altogether absent. In fact, their presence on earth has been a great source of peace and cohesion to the human society. This infinite divine Consciousness, this Breath of God in you, will leave you no peace, grant you no happiness, give you no rest, until you experience it. Life will continue to be a problem in one form or the other, until you seek conscious communion with God. The world, the body, the mind and the life will give us no rest, no peace and no happiness, until we experience this highest divine Consciousness in us, until we establish conscious relations with this divine Light in us, until we become lovers of Wisdom, Light, Truth, Beauty, until we become mystics, saints, sages and men of God-experience. If not today, hundred lives later, you are bound to experience it, and be mystics. You have to be men and women of God-experience. You have to be superhuman individuals, commanding divine wisdom and divine peace, experiencing divine happiness, and consciously living and moving in the endless creative Beauty of God-Consciousness. As all of you have already chosen the path that leads to infinite divine Perfection, you are blessed. Depending upon the measure of the purity of your heart, the extent of your freedom from all the depressive and complicated earthly affections and ties, the wisdom and knowledge in you, the intensity of your love for God, the number of disciplines you assign to your inner nature, the freedom from lower, human, mental, nature you enjoy, you will experience God, in daily life. Great men have, in their attempt to gain enlightenment, in their struggle to gain an experience of the Infinite, in their hunger for God-Realization, evolved many methods of meditation. Some special meditation practices have been revealed by the Grace of God, to the aspiring humanity. You have to choose that method which is in harmony with your temperament, which best suits your inner needs, and which is also in accord with your outer conditions and circumstances in which you live. If all of you were monks, ascetics, renunciates, and full of divine knowledge, then I would speak to you about higher types and forms of meditation, which would assist you to explore more intensively the greatest powers of the infinite divine Consciousness. I could also disclose to you the secrets of sitting in a particular pose, night and day, for months on, and absorbing yourselves in the explorations of the divine Consciousness, of giving yourselves a first-hand knowledge of that timelessness and spacelessness of the Consciousness within you, of discovering for yourselves the higher worlds, as also the world of divine entities and beings, of finding yourselves in possession of those powers that capacitate you to perceive the highest invisible divine Presence, Powers, Personalities. But as you are neither monks, nor ascetics, nor renunciates, but simple, noble teachers, doctors, professors, businessmen, employers and employees, housewives, let us talk of those methods of meditation which were resorted to by humble saints like Brother Lawrence, who could experience God's Presence while serving in the kitchen, while washing the dishes. Let us deal with methods of meditation which were resorted to by hundreds of housewives, saints who had to attend to many fields of pursuit, profession and activity. And let us put aside that exploration of the divine Consciousness which is resorted to by the greatest ascetics, renunciates and monks, men who have equipped and trained themselves to sit in a single pose day and night and night and day, for months on. Those conditions of consciousness which sustained these monks and renunciates are not easy of description, and will not be very intelligible to most of you, though some of you grasp the truths of those conditions of consciousness. Men who are awakened to God's Presence, women who are in a position to find, discover, adore and love God everywhere, are those who have new eyes, and they transcend death, sorrow and suffering. The God-intoxicated saints and sages are in another world of experience, while living in this world. The problems of the body, the problems of a social life, the problems of the mental life, are not their problems. All these problems have been overcome by them, in their superior states of the soul, in the higher dimensions of their consciousness. Their horizons are broad. They have telescopic eyes. They have microscopic eyes. They have in their heart a seismograph. Their inner faculties are exceedingly sensitive and constantly responding to the divine Presence and Power. Any flower can disclose to them the infinite wealth of the beauty of the supreme Godhead. Any sight in this world which you consider as ugly, dirty, evil, can put them into an ecstatic adoration of the Divine. A look at the snowy mountains is a sufficient stimulus to put them into an immediate experience of God. A look at the stars constitutes adequate inspiration to put them into a wondrous worship of the Divinity. They live and move in a powerful God-Consciousness. The perfection which is of the Kingdom of Heaven, the perfection which is in their own soul, is visible to them everywhere. The peace that is in God, the peace that belongs to the Kingdom of Heaven, the peace that is an attribute of the immortal consciousness within us, is constantly, consciously experienced by them. There is no trouble, no sorrow, no doubt, no problem in their lives. They are really superhuman. They are embodiments of divine Love. They are incarnations of divine Peace. They are truly the little children to whom the Kingdom of Heaven belongs. They are the pure in heart, to whom the whole nature is vibrant with God-Consciousness. All these powers that belong to them, all these qualities of nature that are characteristics of them, are there in you. If not great purity, some purity is present in you. If not endless knowledge, some knowledge is present in you. If not superhuman patience, some patience is present in you. If not all-absorbing love for God, at least some love for God is present in you. If all in you is not rendered receptive and responsive to the divine Presence, yet there is something in you which is able to appreciate things of God. Yet there is lurking love for God. If you could only develop these powers and qualities of your inner nature. If you could grow in them, or allow them to evolve, to a degree and extent that are very great, almost superhuman, - then you will be living, while yet here on earth, in a world that is of the Divine. Many of you are familiar with many types of meditation. There is a way of emptying the mind. One type of meditation prescribes your constant gazing upon the light of a candle. There is a method of meditation which requires of you the counting of your breath, or concentration upon the inhalation and exhalation. In this manner there are many types of meditation, meditations which embrace even the practice of concentrating upon the psychic centres, meditation upon special objects, and so on. But remember, apart from causing in you a kind of stillness of mind, apart from granting you a very fleeting and passing peace of mind, all these methods bring you nowhere. Meditation must make us better each day. Meditation must transform and transfigure our nature. We need that meditation which would purify our heart, exalt our nature, deepen our spiritual awareness, make us more and more noble and divine. We need that type of meditation which would grant us more illumination, make us wiser each day, enable us to endure the difficulties of life, and behave in a way which is characteristic of those who know God. With us, meditation should be something that evolves our inner nature, increases the saintliness of our inner being, expands our inner consciousness, liberates us from the limitations of an animal nature, and turns and transfigures the whole of our inner character. And therefore, we have to be careful in choosing the type of meditation. In choosing a practice for perfection, we should be guided by the wisdom and love of God. So, in meditation, the object of our meditation should be God Himself, - should be some aspects, some qualities of God. In all our meditation practices, God must be our central aim and goal. The moment we close our eyes, something of the Divine must be encountered. The more we contemplate upon the love, light and peace of God's Presence, the more of that love, light and peace must sink into our nature, and the more these qualities should be made manifest and patent in our daily life. Every meditation should enable us to bring something of the light and nature of God into expression in our daily conduct, and enrich our life. After each meditation we must be in a position to live our life at home and in society, with that grace, that dignity, that power of accomplishing great works, that belong to men of dynamic wisdom, to angels of sweetness, - to those who are not perturbed by the misdemeanours of the members of the family and the society, and whose presence diminishes the numbers and the strength of such misbehaviour. Meditation grants us so much of inner strength and freedom that we remain unaffected by, and masters of, the circumstances and conditions of everyday existence. We find that our action is guided by a knowledge that is more than rational, and therefore so perfect, effortless and fruitful. Our reactions to things, persons and circumstances are dictated by a nature and a wisdom in us that are superior to the circumstances, things and persons. After every meditation, our life in our house, and in our office, should be governed by that knowledge, that goodness, that soul-power that are troubled by nothing, shocked by nothing, affected by nothing, tempted by nothing, misled by no force, external or internal, and are exceptionally equipped for doing things that result in the general welfare of mankind and nature. We find ourselves guided by selflessness and all-inclusive love. After every meditation, we must make manifest in daily life a rare amount of patience, a rare amount of calmness, and the real power of the inner soul. Our lives must be marked by unusual self-control, and remain above temptations. If our meditation does not help us in this direction, there is something wrong with us, or with our meditation. But also we have to bear in mind that special conditions have to be offered for a proper and fruitful meditation. Special disciplines have to be imposed upon ourselves in order that our nature may be ready for right meditation. Constantly there must be the action of discrimination. We must see what is good and what is not really good; what is valuable and what is not really valuable; what helps us come closer to God, and what drags us down into a lower stage of existence; what leads us to purity and perfection, and what reduces us to a little animal of complaints, jealousy, greed and passion. Constantly the faculty of reflection must be brought into action. We are rational individuals. If it is true that we are civilized, educated, honourable, then our life has to be liberated from an existence that is ruled by discord or darkness of higher ignorance. Our life has to be governed by reason and wisdom, guided by a faith that never fails us, ruled by a love for the all-knowing and all-seeing God. We are in the universities of the world. The earth is the field for growth and evolution. We are children of God, and therefore must refuse to behave like those who belong to the earthly nature. We must constantly educate ourselves, culture our nature more and more, acquire higher knowledge. So, there are some disciplines which must be resorted to, if we are to outgrow the errors and imperfections our unhappy human nature surrenders us to, if our meditation is to be fruitful, if we are to succeed in our efforts at God-Experience, if we are to make of our life an epic of peace, gentleness and sweetness. There are some foods which must be avoided. The chemical constituents in them are such that, for no fault of ours, they excite passions in us. We must choose the food that brings about a calmness of mind and a calmness of the nerves. Because the food tastes delicious, we take an extra amount of food, we take more than necessary. Then, the energies, the fire, the warmth from our head and heart will sink down into the stomach. The gastric juice is busy at work. The digestive system is hard at work, and needs for itself all the warmth and electricity. So, we will be left empty in the head, and there will be no inclination for the practice of the Presence of God. We should at no time fill the belly, more than two quarters. This is the dietetic discipline. It is an essential discipline for refining our nature. You cannot take six glasses of wine and practise the Presence of God. Therefore, we have to be exceedingly careful in the choice of our foods and drinks. Apart from the dietetic discipline, there are moral disciplines. Whenever there is an impulse of jealousy in your heart, at once conquer it by special methods, by listening to the voice of wisdom, by developing the quality that is the opposite of jealousy. At once close your eyes, extend love to the person in relation to whom you are jealous. Mentally give all that the other person requires in life. Completely outgrow this emotion of jealousy, by development of an extraordinary generosity, charity, sympathy, love. Close your eyes and wish everything wonderful for everybody on earth. It enables you to overcome jealousy. This is an exercise in the field of moral disciplines. In this way, remove all the negative qualities from your nature by appropriate methods and by development of opposite and positive qualities. Conquer in yourself every moral weakness. Now we have seen the nature of dietetic discipline, the nature of moral discipline. Then there is the spiritual discipline. One of the spiritual disciplines consists of reducing the number of your desires. If you have the desire to play tennis, to drive the car, desire to go to the cinema, or to go to the market, go to friends, then your time, attention and energies are distributed among so many desires and objectives. You would have no time for your self-culture, or for practice of meditation. In order to find time for your inner development, - in order to free your heart and mind from chaotic activity, to free your mental energies from dissipation in the multiplicity of activity, and find time for inspiring study of higher literature, for doing good and charitable works, for prayer and meditation, - reduce the number of your desires. Too many comforts are not advisable. Reduce the number of comforts. Live a life of independence. Some people are so much dependent on the car, that even for covering a distance of one hundred and twenty metres they would need a car. This type of dependence upon external things is not advisable. Dependence upon many things for our comforts is not advisable. It enslaves us to them. We are slaves not only of the mechanical things, but slaves of many other things. We must be masters, and therefore we should cultivate better habits, and exclude from our life enslavement to certain luxuries. We would then be more conscious of the inner Strength in us, so that we would be in a position to manifest higher qualities of its nature which make us masters of matter, body and environment. All these will be very necessary for proper and fruitful meditation. It simplifies the inner mental life. Generally, the mental life of normal man and normal woman is chaotic. There is a great disorder in the normal mind of the normal' individual. There are too many passions, instincts and urges in it, too many useless and wasteful thoughts, too many negative and corroding thoughts, too much of that lumber and clutter. It is like a cellar, a garret, full of useless things. Such a mind is not capable of a higher vision. Such a mind is constantly overruled by limitations, weaknesses, depressions, unhappiness. Such a mind is not fit for meditation, can never practise the Presence of God, and it lives with the negative qualities of the human nature, and constantly spins unhappiness for itself and unhappiness for others. Therefore we have to simplify our life, introduce harmony and order into our minds; exclude from our life, interests, pursuits, all activities which are not conducive to our growth and progress, and all works that do not contribute to our development and inner spiritual evolution. We have to put our life on a higher footing. Thus, there are many disciplines which are very essential for fruitful meditation. Mere withdrawal from the outer world, mere closing of our eyes, is not going to help us present the right conditions for meditation. When we withdraw our mind's attention from the external world, the menagerie within the mind will assault us. There is no experience of God possible. The moment we sit for meditation, instead of God coming and standing before us, our nature, the disharmony of our relations with our neighbour, the pictures from the cinema that we had visited, will stand before us. Or, our hatred for our enemies, - any one of the negative forces and dark powers can arise from within us. Any one of our unfulfilled desires can assault us, and any of our secret longings and passions can arise and claim us. Therefore, if our meditating is to be fruitful and grant an experience of God, we have to present not only external conditions, but also a proper and right internal environment. By finding a solitude in your closed room, by keeping and causing round yourself an environment of silence, by closing your eyes and thus shutting out the world of sight and its distractions, you are not in the right circumstances for the right meditation; for, the mental activities within us will create great noise, will place us right in the heart of the city, in the heart of the market, and complicate our movement towards God-Experience. There must be an internal stillness and solitude. Internal stillness and solitude are not possible if your mind and heart are not pure. So, the moment we close our eyes for meditation, it is true there is nothing visible outside, but nothing should be visible inside either. What should be visible is God alone. Within us, there should be a peace in which we grasp the nature of God, a joy in which we hold God-experience, a light in which the inner consciousness is dynamically active. In this meditation, we are not aware of the body, of the external world, of the internal world of mind. What we are conscious of, is God alone, His Nature and His Presence, His Peace and His Light. We are safe and peaceful in His Arms. It may be, because of our imperfect nature, inadequate faith, inadequate love, we are not able to see God. But, He is seeing us all right! We may be not able to hear Him, but He is hearing us all right. He is omniscient, omnipresent, present in each cell of our being, seeing and witnessing us, not only from within, but from without us. He has been always with us. He is now with us. He will always be with us. Therefore, when we close our eyes in meditation, the supra-electronic infinite Light of God has already registered what we are about to do. With a smile on His Face, God, the all-merciful Being, is immediately witnessing it. Though we may not, on account of our imperfections, be in a position to see His Face, He is present within and without us, above and below us, and all around us. As He is with us, not only as the inmost Consciousness in us, but also as the environment around us, meditation must be a powerful condition for the experience of God. Blessed are those saints who have disciplined themselves to a high pitch of perfection. They are able to see God, as you see each other. They are able to live and move in the powerful and transforming Consciousness of God, in the all-sustaining Presence of God, in the all-maintaining Power of God, even as the ordinary man lives and moves in space and air. If men of great knowledge, high intellectual gifts, and exalted mental powers, do not love God as a personal Being, they do love God as the Self in their inner being, as the divine Consciousness, as the witnessing "I"-Consciousness, as the fundamental Ground in them, in all beings, and in the universe, as the Consciousness of all consciousness, as the Self of all selves, the Substance of all substances, in all beings, in all Nature, and in themselves. When they sit for meditation, they see inside and outside, nothing except the divine Consciousness, the infinite Self, the Reality of all realities, the bare face of the Absolute. Their discipline in meditation consists of continued and unbroken contemplation upon this infinite Divine Self. These people are sharp in their intelligence. They are predominantly mental beings. They are not governed so much by an emotion of love of God, as by a vision of the knowledge of God. Self-knowledge and Self-experience is their immediate goal. God as the Self is the only Reality for them. Even as a scientist, looking at the multiplicity of the physical universe and nature, seeks to reduce them to the one fundamental substance, and declares the world to be energy in motion, or a structure of force, these men of the Self-Knowledge reduce the world to the one Self, the Consciousness infinite. In meditation, they are trying to absorb their whole awareness in the experience of this infinite Self. The world of matter is resolved into the substance of the infinite Self. They themselves are nowhere. All is dissolved into a wondrous and dynamic experience of the infinite Self. When this meditation is fruitful, their whole being is identical with the infinite Self. They enjoy the infinity of delight, the infinity of peace, the infinity of perfection, and the infinity of power and life. These men of knowledge, if they were to be busy in the world after their period of meditation, would carry the experience and the light that they received in the moments of meditation into their work and into their external life. They will not leave their inner hold upon this experience in meditation, while yet in the daily circumstances and situations of life. On the other hand, the knowledge they acquired, the divine Light they saw, the peace they found, in meditation, will rule, guide and govern their daily activities, their behaviour and their conduct. Even while bathing, or gardening, or driving a car, or giving directions as directors of a firm or a factory, something in their heart is in tune with the Self they contacted in the moments of meditation. Compared to this life, power and perfection, this peace and joy, that the man of wisdom and Self-knowledge has in the hours of meditation, you can ask yourself what is the nature and value of the peace, joy and perfection of normal man on earth! The ordinary man's life seems to be dangerously subnormal, a very unhappy condition. Our real manhood, the real dignity of our life, the real power and force and perfection of our inner being, are disclosed to us only when we touch and experience God. A person may be a scientific genius, or an immortal poet, or a genius in any of the arts or social sciences of the world, but if he is not governed by a higher vision, if his life is not lit up with a faith in the Invisible and the Infinite, if he has not grown conscious of the Absolute within him, he is no better than a terrified animal which is exposed to disease and death. Therefore, man's true manhood and genius consists in his relations with the highest power in his heart. Man's true dignity lies in his conquest of his lower nature. We have to constantly exalt our being to a higher level of character and living. And though we may not achieve endless divine perfection in this life, even the mere attempt to move towards that perfection is sufficient to give us an inner strength which enables us to bear the difficulties of life; to help us find a peace where others do not find; to grant us a joy which cannot be bought with anything on earth; to give us an inner power and strength which can enable us not to succumb to and be broken by life's burdens, difficulties and challenges. Let us come to another type of meditation which belongs characteristically to men in whom the emotion of love is fully developed, whose life is predominated by love and not by knowledge, who approach God-experience through the power of love their hearts hold. The devotees, the lovers of God, proceed to experience God with whatever excellence and power there is in their purified heart. 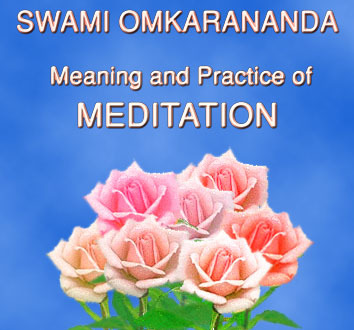 What is the object of their meditation? What is that they find and experience in moments of meditation? In what are they absorbed during the hours of meditation? It is not the infinite Self but God as a Person. But, this God as a Person is the same as the Infinite. The devotee chooses to approach God with a form. So, in his contemplation, the object that he encounters and experiences is a personal God. Earlier, before he started the practice of meditation, he has so disciplined his nature, so purified his heart, that when he sits for meditation he finds himself face to face with his personal God. With a heart full of joy, with a nature pervaded by peace, his consciousness is absorbed in gazing at the beauty of his infinite Beloved. His conscious attention is placed, fixed, focused upon the presence and power of the God. During this hour of meditation, there is in his mind and heart only the play of the qualities of the supreme God. His heart and his mind are filled with the nature and presence of the personal God. And the presence is constituted of unlimited Love, endless Peace, infinite Power. After such a meditation, if this person engages himself in household work, or office work, or any form of work, that work will be governed by the experience he had in that hour of meditation. His eyes are pure. All is lovable for him. All are angels to him. All are good to him, and he never judges anyone. He never holds anyone in condemnation, however wicked that person be. He sees the face of the God in each and in every heart. He works for God, who is resident in all. He is conscious of God's Presence around him, within him. And something in his heart is constantly holding to this experience of God's immediate Presence. In the hours of meditation, this devotee, this lover of God is completely exposing his whole inner being to the powerful, transforming Presence of God. Supposing at the beginning stages of his meditation he did not know how to love God, how to conceive of Him, in what form to think of Him, he would choose one of the traditional personal Gods. He might take the form of Jesus, or of Mary, or of any other one hundred and one thousand Gods in the world. It does not matter which form of God he chooses; it does not matter which name he gives to God. The responding God is one and the same. Whether you call Him Mary, or Jesus, or the all-responsive infinite Godhead, at once a response comes to you in that particular form and to that particular name. Through that form, through that name, you will ultimately arrive at the experience of the infinite Godhead. There is a beautiful light. One inspired poet says, "O my light!" Another inspired poet says, "O my love!" A third inspired poet says, "O my joy!" A fourth inspired poet says, "O my life!" A fifth one says, "My peace and my strength!" Light is one. Different poets have approached it differently, and consequently described it differently. Different poets have exclaimed its presence differently. Therefore, whether you call God the infinite Self, or the timeless, spaceless, featureless Absolute, or "My Jesus", or "My Mary", or "My Truth", or "My Beauty" or "My Beloved God" or "My all-protecting and all-blessing Mother" - it is the same. May the divine Grace descend upon you more abundantly, and illuminate your lives with intensive God-Consciousness. May it conduct you into peace, happiness, progress, perfection. May the hand of God grant you radiant health. May his merciful heart liberate you from the limitations and the difficulties of life. May the purity of your hearts, the aspirations in your mind, the goodness in your lives, grow more and more, and draw from the Divinity the choicest blessings. Blessed is the moment when we are in a position to place our heart's energies and mind's attention upon God's Presence. Blessed is this moment when we are completely oblivious of the physical world and are alive to God's Consciousness and Power. Question: I have read that there was in Japan a Zen monk who was an adept in meditation. Among the men from all walks of life who were attracted by his reputation as a teacher, was a well-known professor of the Imperial University of Tokyo. The professor went to see the monk, who offered him the customary green tea. Placing a cup before the distinguished visitor, he poured tea into it until it became full. He continued to pour, and the cup overflowed. Seeing the tea spilling over the table and onto the floor-mats, the startled professor asked for an explanation. The Zen monk said, "I can fill what is empty, but not which is already full. You have come to me with your mind full of ideas, ambitions and desires. If you seek my instructions, empty your mind, forget all that you have learnt, and rid yourself of all harmful and useless matter. Then return and I will teach you." Dear Swami, do you also recommend emptying the mind, forgetting all that I have learnt, ridding myself of all ambitions and desires, as the first condition for my meditation practice? For the last ten years I have been struggling hard to make real spiritual progress, and I request you to show me a way for obtaining success in meditation. Answer: No. The Grace of God operative in me, does not permit me to make the mistake of recommending to anyone the act of emptying the mind, either as the first condition for meditation, or as the central aim of meditation. It is a bad psychology, and a real lack of knowledge of the nature of mind, that presumes that one can easily unlearn all that one has learnt, or successfully strip oneself completely of all desires, wishes, ideas, or in any way empty the mind truly. The history of spiritual experience around the world has far too few instances of those who have obtained the ultimate in spiritual enlightenment, purely by emptying the mind. Human experience at its best around the globe, clearly shows that it is impossible to make the mind empty, and those who can succeed for a few minutes are rare, and those who have succeeded thus far cannot sustain themselves in that state any longer. However universal this practice of emptying the mind may be, the results it brings are too poor to engage the attention of real seekers of Truth, Enlightenment and spiritual Perfection. Even if we succeed in making the mind empty for a while, there is no guarantee that enlightenment will occupy the vacuum. Quite likely, the darker forces may make an easy and full use of the vacuum! However, there are other ways to obtain Enlightenment. I would not send away that professor, or any other seeker for that matter, and ask him to come after he has emptied the mind. I would make use of the same filled cup to demonstrate something else. If the cup is full of poison, the best way of pouring it out, in this context of the bafflingly complex and difficult human mind, would be to go on pouring into it nectar, until all the poison is displaced automatically, and what remains is the nectar. Our purpose is achieved without having to render and keep the mind empty, in order to fill it later on with something called nectar. If the professor's mind is full of desires, he can best succeed in eliminating them only by going on pouring into his mind the great and burning desire to know the Nature of the Truth. This one strong and central desire, sublimates a hundred other desires. The one growing and consuming love for God, takes up and sublimates into itself all other loves. The one wish to know, to experience, to express the Truth, sublimates into itself all other wishes. What is more, that desire, that love, that wish, being dominant, governing, ever-present, sink into the unconscious, and throw up, burn, transform the entire troop of concealed and dark forces, tendencies, residual potencies. It is then that the human individual stands completely illuminated inside and outside. That one desire, when fulfilled, will fulfil all other desires. That one wish, when obtained, fulfils all other wishes. It is easier to turn the energies of many desires into one strong desire, which creates in the mind just the condition that is essential for Enlightenment, - which in its turn banishes from the mind that last desire, - rather than sitting down and attempting to chop off one desire after another, only to find new desires arising with every desire that is killed. It is impossible for anyone to claim that one has succeeded in killing all thoughts. The very act of such a claim implies that one is caught up in thoughts. Even if we perform a superhuman feat in dismissing all thoughts, wishes, desires from the conscious mind, there is beneath it a vast, immeasurable, treacherous underground of the unconscious, which will constantly topple down the emptiness created at the conscious level. Who can do this impossible task of emptying the subconscious or the unconscious? What technique is there for such a task? And where in the world of psychology, or human experience and wisdom, have you ever heard of any one escaping from problems by merely making the mind empty? Does rendering the mind empty make, by some strange act or miracle or magic, the entire range of the age-old unconscious empty of its content? We find that the most pure among men, and even great saints, have had their trials and ordeals at the hands of their unconscious. A completely pure person has impure dreams. How do you account for it? Why has not his purity cleansed his unconscious completely? A person who has been blameless in daily conduct for decades, suddenly finds himself gripped by some moral weakness. How can one easily empty this treacherous unconscious being, which conceals in itself numberless dark forces - and without this achievement, how can one claim that one has emptied the mind? How shall we empty the unconscious of its content, except by constantly pouring into the conscious all that is illuminating, so that what is poured, day and night, percolates into the unconscious, and displaces the darkness therein? In order meditation may be highly rewarding, we have to impose on ourselves some special disciplines. Constant exercise of our capacity to love, is one of the disciplines. The development of a magnanimous heart, is another discipline. Not to be affected in any way by the worst criticism or insults unjustly given us, is another discipline. We have to be kind, restrained in our speech, wise, highly self-controlled, and should never allow any impulse, or instinct, to lead us away into error, but to be full of self-control that is in harmony with the dignity of the human individuals we are. We should cease to be affected by external conditions, and seek to influence them for the better, by entertaining the better thoughts and feelings, and by establishing in ourselves order, harmony, peace, delight. The intelligence has to be trained in many ways. It has to be liberated from narrowness, and trained to admire whatever soul of goodness there is, even in things evil and bad. Constantly the mind has to be educated to perceive, and grow sensitive to, that which is beautiful, noble, true and valuable. Broad views, a charitable nature, the fire of aspiration to be better and yet better, and to contact that infinite Power which is the parent of all that is created, should characterise us. The fire of knowledge, which burns the impurities and the crudeness of our nature, and transmutes it into nobler and divine substances of living, is very essential, and has to be kept constantly glowing. An assimilation into our life and experience of the great ideas and illuminating and life-shaping thoughts left with us, as a legacy, by the greatest men of the preceding centuries, is yet another essential for success and progress in the practice of meditation. Constant cultivation of the Presence of God, constant inner and background awareness of that infinite, invisible, all-benevolent Power which is always watching us, protecting us, sustaining us, and faith in the words of the world's great mystics, sages and men of God and universal love, are requisite for rapid progress on the path of perfection.